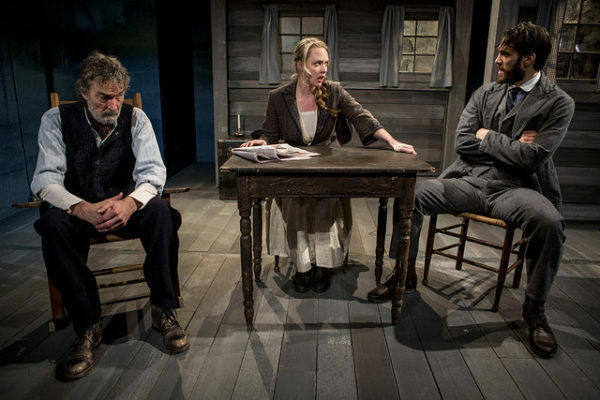 At a time when systemic misogyny has given rise to a president-elect accused of serial sexual harassment, director Peter Richards has opted to stage Eugene O’Neill’s Anna Christie, a play that offers a complex examination of men’s moralization of women’s sexuality. The results are mixed. Anna (Therese Plaehn) hates men, “hate ’em—all of ’em!,” and with good reason. Her father Chris (Stephen D’Ambrose), a Swedish sailor, sent her to live with male cousins on a farm in Minnesota while he spent the next 15 years at sea. Her cousins worked her like an indentured servant, driving her into prostitution. Chris never knew any of this of course, and was delighted when she decided to reunite with him in New York. Now the captain of a coal barge, Chris takes her aboard to live with him in his cabin, where she meets and falls for Mat, an Irish sailor (Ben Chase). Chris is incensed—Anna is too good to be a sailor’s wife, he thinks—and does his best to break them up. But both his and Mat’s perception of Anna sour when they discover the truth about her past. The production remains mostly faithful to O’Neill’s original script, save Plaehn’s interpretation of Anna. To distance herself from the oft amused but shame-ridden Anna of the text, Plaehn plays her as resilient but ceaselessly suspicious and quick to anger. Her anxious eyes dart through any conversation as she rubs and scratches at her neck area—it’s as if merely inhabiting a female body in the presence of men is enough to make her want to jump out of her skin. This unevenly effective choice works best in her biggest moments, such as her climactic confrontation with Mat in the third act. But in quieter instants, her interpretation clashes with the character’s actions—why would this justifiably angry but self-assured young woman come clean about her past when she has nothing to feel guilty about? Plaehn’s Anna might possess a more updated psychology, but her motives no longer make much sense. D’Ambrose deft handling of his character’s Swedish dialect is an unexpected highlight. Lanky and fully-bearded, the actor disappears into Chris, making believable poetry out of repeated condemnations of that “devil sea!” Another stand-out performance: Tina Johnson’s Marthy, who shouts her crackled lines like a spray of sea salt. Chase brings out Mat’s nuances by whipping a shock of dark reddish-brown hair when frenzied and frequently dipping his head in a way that somehow communicates both a working-class identity and fraught feelings toward Anna. Scott Aiello as bar-keeping Johnny-the-Priest also gives a fine performance. The spare, modular set keenly captures the warm, downtrodden feel of Johnny’s bar before transforming in later acts into Chris’s cabin on the barge. The predominance of grays and blues evoke a moody waterfront that any sailor of the 1920s would believe had some metaphysical sway over fate. Alas: if only fate had led to a production that better connects the outmoded morals of the past to the ideals of today.